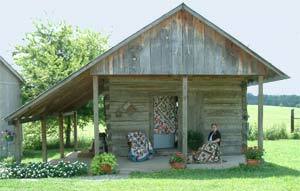 Kay Voss opened Mama's Log House quilt shop in 1982 in a historic log house built almost 200 years ago. The log house differs from a log cabin because it is constructed with squared off, hand hewn timber, in this case mature oak trees. Built by a doctor on this site in the early 1800s the log house reflects one of the construction techniques of the early settlers to the newly opened Louisiana Purchase territory. This historic log house is believed to be one of the oldest structures in Arkansas, and has been in Kay's family since the 1940s. The expanded quilt shop now occupies a large, new building adjacent to the log house and an education building, The Academy, across the street. Kay's life long interest in sewing, crafts and quilt making was nurtured by both her grandmothers, her mother, and her two sisters. She has observed that quilt making is the only subject that men, women and children can all converse about, because the subject usually brings up memories of mothers, grandmothers or friends who connected and nurtured their communities with the stitches of their quilts. Her own passionate interest in quilt making has offered Kay opportunities to travel and to meet many talented quilters. With more than three decades of experience, Mama's Log House quilt shop is known as an established, reliable and fun source for quilters whether visiting the shop in person or visiting online. Quilting Fabric: Here at Mama's Log House quilt shop we carry only 100% cotton broadcloth and flannel because we know that choosing quality quilting fabric will insure a positive outcome. We carry complete collections of designer fabrics and coordinating fabrics including Thimbleberries, Moda, Aunt Grace, Civil War reproductions, In The Beginning, RJR, Benartex, Oriental, Patriotic fabrics and Batiks. From batiks to flannels, from shirtings to 30's pastel prints, we want you to have lots of choices in quilting fabric to meet all your quilt making needs. In partnership with Next Door Neighbors Dyeworks, Mama's carries Bonnie Turner's fabulous hand dyed fabrics to add a unique touch to your quilts. Quilting Supplies: Mama's has an extensive inventory of quilting supplies and "the tools of the trade" like rulers, rotary mats and cutters, stencils, quilting frames and quilting hoops as well as your favorite sewing notions. Yes, the only quilting supplies you really need are a needle, thread and a thimble, but the right tools contribute to completed quilts. We will consult with you on which quilting supplies can assist you through each step on your quilt making--this is one of the features that makes us a full line quilt shop. Quilting Books, Patterns and Quilt Kits: Quilting books can spark your creativity and we carry the current quilting books and magazines immediately after publication. Your favorite quilt patterns from Martingale, C &T, Art To Heart, Piece O'Cake, Whimsicals, and more are waiting for you to pick your fabric and start your next project. If you'd rather purchase a quilt kit including the pattern and fabric, you can start your quilt immediately. We offer a selection of quilt kits and lots of coordinated fat quarter bundles and precuts. Gifts: In addition to our quality quilting fabrics and quilting supplies, we carry other items that we know from our experience quilters enjoy. Choose a surprise for a friend (or yourself) from our selection of quilting jewelry, handmade scissor fobs, or one of our Laurel Burch bags. Mama's features collectible figurines of Santas, angels, snowmen, snowwomen, lighthouses, and ornaments designed by Jim Shore.